10th of August 2011: challenge dataset for task A, B1, B2 has been re-issued! Note: The dataset is publicly available and can be used freely for research purposes. When using it, please cite the two references below. Also, let us know if you have any publication that uses this dataset (see current list of publications). Data is provided as a text file containing a matrix where each row corresponds to a sample. 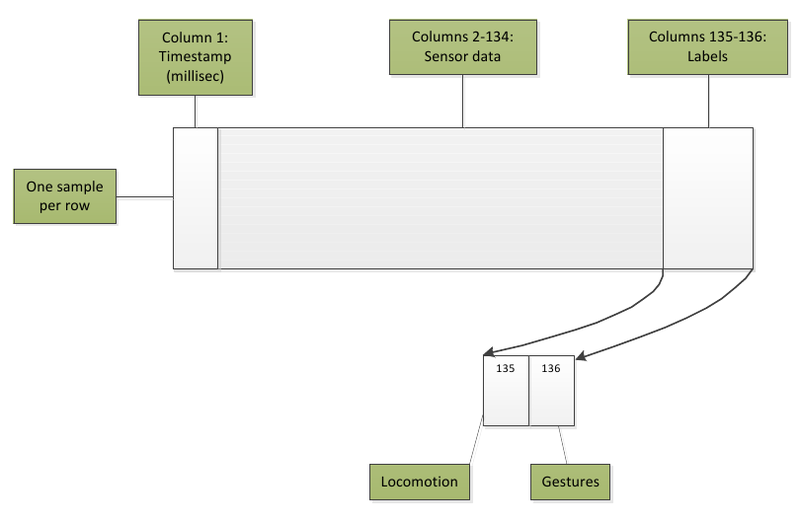 The first column includes the sample timestamp (ms), and the last two columns include the labels for modes of locomotion and gestures respectively. See the example below corresponding to data for tasks A,B1,B2. Note: Bluetooth sensors suffered from disconections during the recordings. These lead to missing samples that are coded as 'NaN' in the provided dataset.